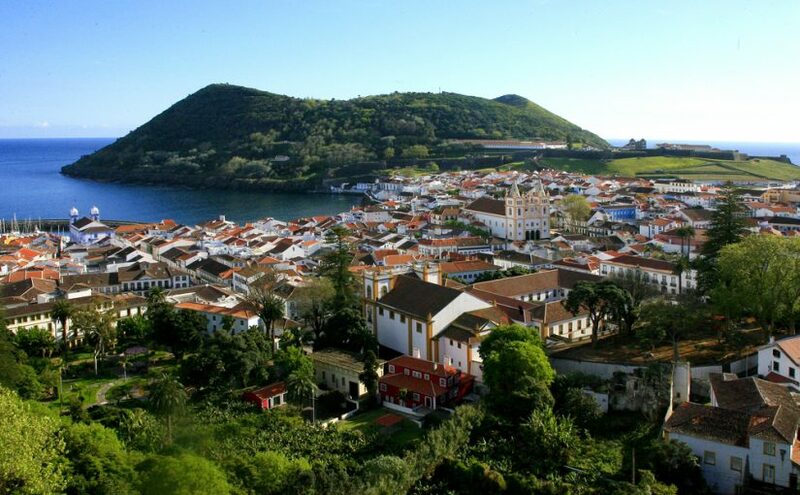 A great holiday in the Azores isn’t complete without visiting Terceira Island. Discover 5 unique places in of interest in Terceira and enjoy this beautiful part of Portugal. Known locally as The Lilac Island, Terceira Island is approximately 90 miles from the city of Sao Miguel and 66 miles from Faial, and is one of the of best places to visit in the Azores. Terceira is unique in itself with historical heritage, culture and a laid back way of life for the locals clearly on show. Then there’s the colourful houses with the triangle chimneys, not to mention the chapels that are painted in bright colours too. There is an abundance of things to do in Terceira, too many to put down on here, but we’ve put together our 5 favourite and unique places on Terceira to give you some suggestions of what to do in Terceira to make the most of your holiday in the Azores. There’s nothing better than seeing nature and on a trip into the Atlantic ocean you’re guaranteed to see either whales or dolphins, or both, at any time of the year. Responsible tour guides and skippers get visitors close enough to see these amazing mammals very clearly, and, now and again, maybe they’ll get you a little wet with a splash of their tail fin! Known as one of the very best places in the world to see whales wild, going out into the ocean and seeing them in the natural environment is definitely top of many peoples’ wish list of what to do in Terceira. About 27 species of whales and dolphins have been spotted off the island and the trips run all year round. See these beautiful creatures as they playfully make their way around the boats. A must do as far as things to do in Terceira go! Have you ever visited a volcano? One of the favourite things to do in Terceira for visitors is to head to the shores of Angra do Heroísmo where you will find a now-extinct volcano, Monte Brasil. With outstanding scenic views over the naturally-formed peninsula this is a terrific place to visit and one of the best tourist sites in Terceira to take in the island. Make the most of your hire car by heading to the summit in it before heading along to São João Baptista Fort which is nearby and the oldest occupied fort in Portugal. As I said history is abundant here and a visit to the island has to be one on the list of what to do in Terceira. One of the places you should know about in Terceira is in the picturesque town of Biscoitos, a family-run wine cellar with a museum. There you can enjoy the well-tended gardens while discovering the history and the art of viticulture in the region. The rocky, windy peninsula makes a perfect place to make the wines as the vines grow from the rich and porous lava rock. If you like wine then Biscoitis museum is a must on a list of things to do in Terceira, and what to see in Terceira too. Antique wine-making tools and the short but very interesting and informative tour ends how it should, with a sampling of the locally produced wines that you’ve just learnt about! You can even buy them, at a very reasonable price. A drive to Praia da Vitória will serve you up with a treat when you arrive as the views and scenery are simply breathtaking. What to see in Terceira? Well, this is certainly one of them. The colourful churches immediately catch the eye and are famous as one of the most popular tourist attractions in Terceira. With cobbled streets, colourful houses, a stunning town hall, a modern marina, and beaches that are simply beautiful, although in the summer months they can be very popular. If you’re planning a trip of what to visit in Terceira, this place has to be on it. In the town wander around and take a look at the old town wall which has stood for over 500 years. One of the places you should know about in Terceira is an ancient lava tube, Algar do Carvão. One of the most interesting tourist sites in Terceira, the lava tube is situated at the geographic centre of the island. For things to do in Terceira, or anywhere else on the Azores, Algar do Carvão is a must as it’s one of only several places in the world where you can actually get inside an extinct volcano! Put your walking shoes on and prepare to negotiate several hundred steps to explore the insides of this amazing geological structure. Talk about what to do in Terceira with anyone and this is a firm favourite. Deep down inside you will find a lagoon glistening in the light shafts, and stalactites above make this whole scene surreal and definitely establish Algar do Carvão as one of the top tourist attractions in Terceira. Overflowing with history and culture you may be wondering just what to see in Terceira or even be a bit overwhelmed by the amount of places of interest in Terceira. Plan ahead, and you’ll get to see the very best the island has to offer, it’s best to allow a few days if you can. As regards to what to visit in Terceira we’d recommend you take in all of the above and the many historical and military tourist sites in Terceira that are well-maintained and affordable. Just strolling the cobbled streets before heading for an evening meal past colourful houses and churches in the shadow of a volcano makes this place unique and enjoyable as are so many tourist attractions in Terceira. A great holidays in the Azores can´t be complete without visiting the Terceira island. Find out 5 uniques places at Terceira and enjoy Portugal.